Drew Styles, from Wigan, has been crowned the UK Plumber of the Year 2017, in the nationwide competition. The 2017 competition saw hundreds of plumbers enter from all over the country, receiving a record number of applications, which only makes Drew’s success even sweeter. Initially, the official competition judging partner, WaterSafe, selected fifteen plumbers from applications based on their skills, qualifications and experience in the industry. The lucky 15 then went head-to-head to win public votes, from which the five with the highest number of votes went through to the final stage. In the final stage, which involved in a 30-minute interview with the judging panel at Bristan HQ in Tamworth, Drew managed to impress with his love for the trade and his views on the future of the industry. As a fourth-generation plumber, Drew embarked on his career at the tender age of six, when he accompanied his grandfather to work. His work ethic and the quality of his services remain at a very high standard today and he is devoted to improving his work in any way he can, with his customer feedback showing his propensity to go the extra mile. Along with his title as UK Plumber of the Year for 2017, Drew also wins his share of £10,000 worth of prizes, including JT, Bristan and Wolseley Plumb Center products, plus prizes from Proper Job Beer, Rothenberger, CK Tools, Salamander, Filplastic, First Stop and BigWipes. Now in its third year, the competition called on plumbers nationwide to enter in a bid to be crowned Britain’s finest. The competition takes place over the course of six months, and is designed to reward and recognise the remarkable talents within the UK’s plumbing industry and ask entrants to demonstrate their plumbing, service and business skills. Other finalists in the competition included Tom Jenkins from Treorchy, Paul Maguire from Glasgow, Thomas Foster from Dundee, and Gareth Lloyd from Hereford. 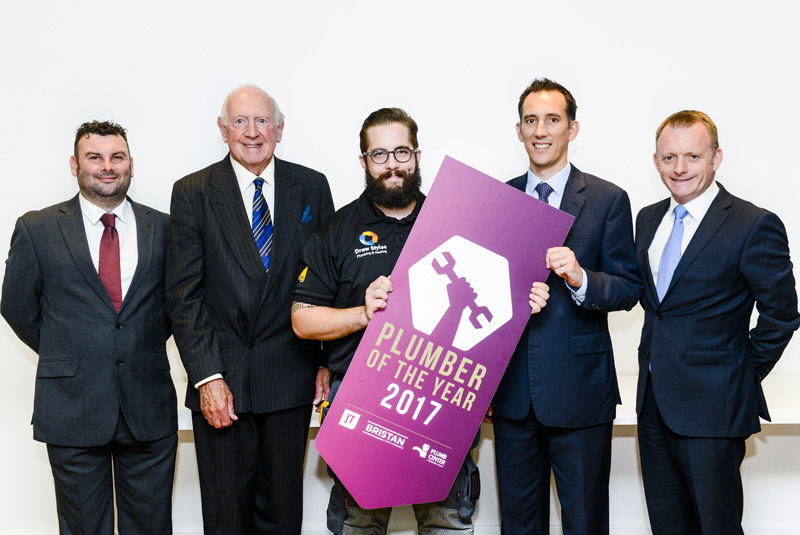 Speaking of his win, Drew said: “I’m really thrilled to be crowned Plumber of the Year 2017 – I’ve had a blast in the competition and I’m really thankful to all the people who voted for me! John Schofield, Sales and Marketing Director at JT, added: “We’d all like to congratulate Drew on his win – it was well deserved. The standard of the competition rises each year so he should be really proud of himself as all five of the finalists were extremely impressive. Drew’s passion for the industry really shone through when he was discussing his work, and that really resonated with the judging panel.